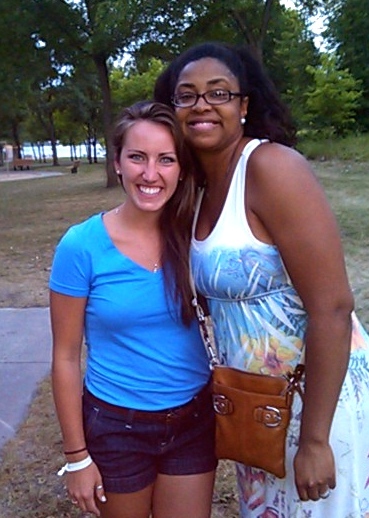 Senior Molly Ashwill ’15 and her summer internship preceptor Tanaha Smith. After three years of coursework and clinical experiences through the Nursing Department at Gustavus Adolphus College, senior Molly Ashwill was looking for a summer internship last spring that would allow her to gain more experience in the clinical setting. Ashwill found what she was looking for through the Hennepin County Medical Center’s (HCMC) Student Nurse Internship Program and is now setting her sights on graduating this spring and joining the workforce. HCMC’s internship program is extremely competitive as approximately 175 applicants are narrowed down to 20 finalists, before six interns are ultimately chosen. HCMC is Minnesota’s premier Level I adult trauma center and Level 1 pediatric trauma center with many nationally recognized programs and specialties. It serves as an essential teaching hospital for doctors and nurses who go on to practice throughout the state. It also serves as a safety net hospital providing care for low-income, the uninsured, and vulnerable populations. In 2013, it performed almost 15,000 surgeries and assisted in more than 2,200 births. More than 537,000 clinic visits and 107,000 emergency services visits were made at HCMC in 2013. It is the perfect place for a student nurse to hone his or her skills. Between June 2 and Aug. 8, Ashwill put in 32 hours per week at HCMC in the float pool. Every day before her shift, she called the hospital to see if she would be placed in a specific unit or on the rapid response team for that day. Throughout her 10-week experience, Ashwill was under the guidance of registered nurse and preceptor Tanaha Smith. 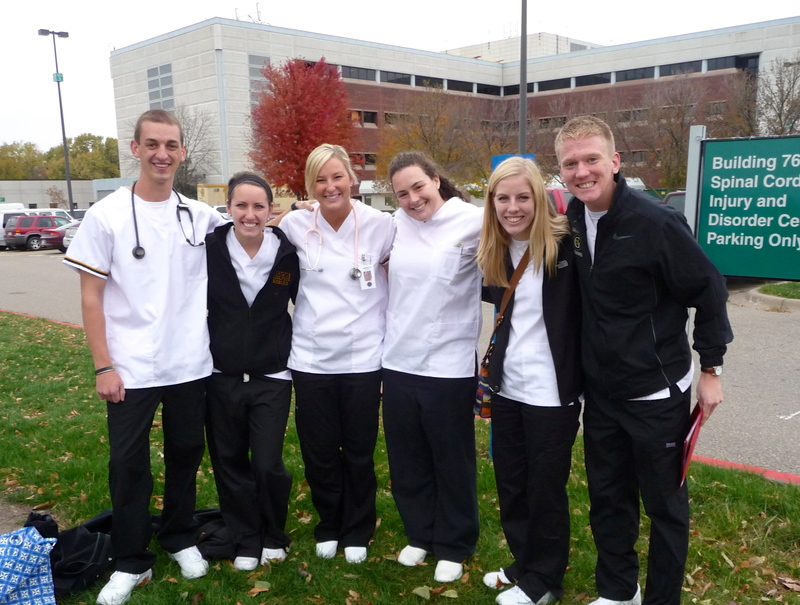 Ashwill (second from left) and several other Gustavus nursing students outside of the Minneapolis VA Hospital. Being placed in the float pool turned out to be a huge benefit to Ashwill as it allowed her to experience life as a nurse on many different units and in many different areas of medicine. Ashwill is now in the middle of her fall semester coursework and has a total of four nursing classes to finish the requirements for her major. She is currently enrolled in a community health course that focuses on population-based health issues such as environmental health, epidemiology, and communicable diseases, as well as a course on obstetrics. During the spring semester she will take a course on mental health issues that will focus on major mental illnesses, substance abuse, depression, and anxiety disorders. She will also take the Department’s Nursing Leadership course which explores the theories of leadership, management, and organizations and the process of managing personnel and work. Her summer internship at HCMC affirmed for her that her coursework at Gustavus has prepared her well for life after graduation.